Heritage's characterful cast iron roll top baths will make a real statement to any period bathroom. Designed with characteristic white 'ripple' enamel interiors, the baths are sanded and primed with an undercoat ready for you to paint it in a colour of your choice. The popular Grand Buckingham Roll Top Cast Iron Bath is available in 2 or 0 tap holes and comes complete with feet with an option of either chrome or cast iron should you wish to paint them to match the baths colour. Manufactured to the highest standards and guaranteed for 25 years. 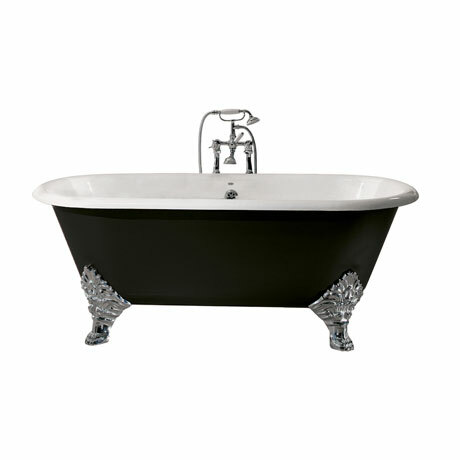 Bath shown in black for illustration purposes only. Please Note - Any taps, wastes or any other accessories pictured are for display purpose only and are not included (sold separately).